For the Weimar Republic, 1921 started out quietly. The gradual increase in prices, due to the ongoing devaluation of the Mark, started later in the year. Before 1921, it cost 40 Pfennig to mail a domestic letter inside of Germany and 80 Pfennig to mail one outside of Germany. By early 1921, the existing domestic postal rate had held steady, but the foreign letter rate had risen to 1.25 Marks, an increase of over 50%. At the beginning of 1921, the highest denomination postage stamp available was the Four Mark value, but that wouldn't be the case for very long. 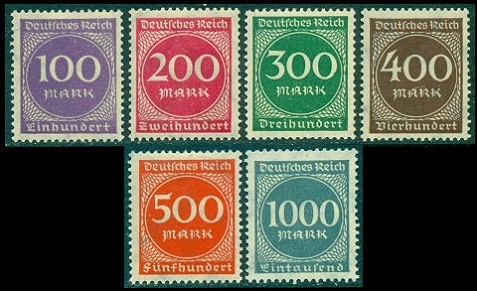 The standard postage stamps used for domestic and foreign letter mail, under 20 grams, and the Four Mark Germania postage stamp issue of 1920, are shown in the image above (Mi. #145 // 53, Sc. #124 // 32). Based on today's economies, one wouldn't think that this was not terribly extreme, but at that time, it was an omen of horrible things to come. 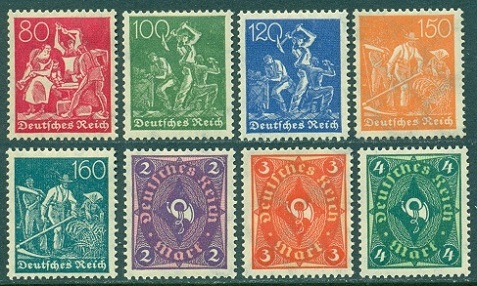 The set of Weimar Republic stamps shown in the images above was issued, beginning in May 1921, on lozenge watermarked paper (Mi. #158-76, Sc. #137-55), and again, beginning in December 1921, on network watermarked paper (Mi. #177-96, Sc. #161-79, #194-96). The new designs featured large numerals on the low values; iron workers, miners, and farmers, on the middle values; posthorns on the lower Mark values; large numerals on the 5 Mk. and 10 Mk. values (not shown above); and plowing on the highest value. The denominations ranged from 5 Pf. to 20 Mk. ... a rather innocent looking set of postage stamps! An odd bit of reality in today's catalog values though. Used examples of the May 1921 issue are relatively inexpensive. With the December printings on network watermarked paper though, authenticated used examples of the Pfennig denominations are very expensive, some of them worth hundreds of dollars, whereas used examples of the Mark denominations are inexpensive. Could that indicate that by December 1921, there was no longer any postal need for stamps that were denominated in Pfennig? Wait a minute! What happened here? 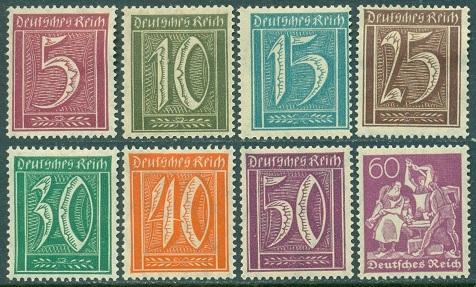 The Weimar Republic stamps shown above (Mi. #238-44, Sc. #221-27), issued between late 1922 and May of 1923, are the same designs as the Pfennig denominations of the December 1921 definitive series, but these are now denominated in Marks! Want to REALLY see what the beginnings of German hyperinflation looked like, in respect to letter postage rates? Look at the table below! Between January and December of 1922, the price of a postage stamp for domestic mail went up 800%, and the price of a postage stamp for foreign mail went up 2,000%. THAT should be ALARMING! YIKES! Somebody brought up the BIG GUNS! The 100 Mk. through 500 Mk. denominations were first issued by the Weimar Republic, in October of 1922, on lozenge watermarked paper (Mi. #219-23, Sc. #156-60). They were again issued on network watermarked paper (Mi. 247-51, Sc. #199-203), and the higher denominations followed (Mi. #252-57, Sc. #204-209), during 1923. During this period, the highest denomination German stamp went from 20 Marks to 100,000 Marks ... that's a denominational increase of about 5,000%! Starting to look like hyperinflation here, but these aren't ANYTHING compared to what was issued, beginning in mid-1923! The REALLY scary thing is that used examples of these stamps are actually COMMON! 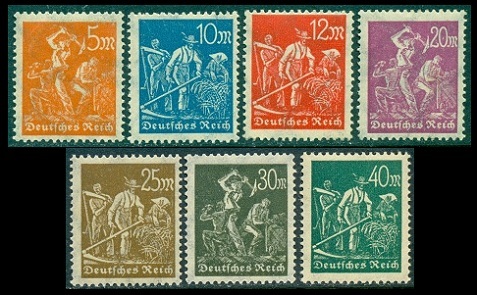 The new Weimar Republic stamps shown above (Mi. #268-76, Sc. #229 // 40) came into use in early 1923. The three high values were issued in September 1923. These designs, along with those of the 1921 definitive issues, would be the ones primarily used for the hyperinflation stamp surcharges of 1923. The stamps used for surcharging were also printed in other colors, different from the issued stamp colors shown here. This looks bad, but, for the German government, the German economy, and the helpless German people, things would get MUCH WORSE!